Since the 16th century the sport of shooting has been the preserve of British aristocracy. But should you receive an invite to spend the weekend on a venerable estate, you’ll need The Rake‘s guide to blending in. 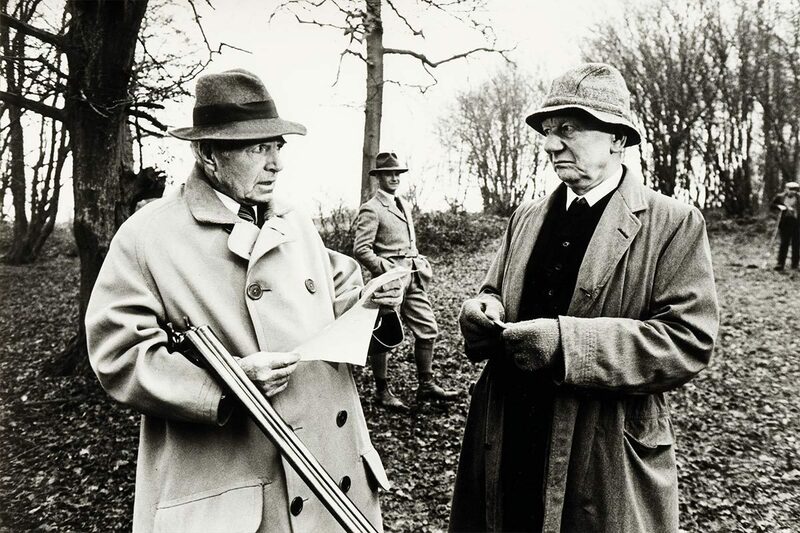 James Mason and John Gielgud in The Shooting Party, 1985. When you think of the aristocracy, what sports spring to mind? Hunting? Possibly, except that’s changed in recent years, since the 2004 ban, and now those on horseback chase a trail laid by quad bikes, which is fairer on the foxes but red-faced sorts splutter that it’s less romantic. Polo? Princes William and Harry play, but then so do dodgy oligarchs and gas tycoons. Croquet would have been a good answer, had the Beckhams not instructed the landscape gardener to map out a croquet lawn at their house in Oxfordshire last year. And I wouldn’t exactly call charades a sport. So by my reckoning that leaves only one option as the toffs’ main hobby: shooting. True, newbies and arrivistes have muscled in on the shooting scene in recent years (more on Richard Caring later.) But if you’re a duke, you will almost certainly still own a large and ancient shoot, or even a few of them, sprinkled across the country — pheasants in Devon, partridges in Sussex, a grouse moor in Yorkshire. The oldest driven shoot in the county is at Holkham in north Norfolk, which is owned by an earl, admittedly, not a duke (the Earls of Leicester). But it remains one of Britain’s top shoots, which sums up all that keen shots love about the sport: exceptional game birds, sensational countryside carefully tended by watchful gamekeepers, and a cleaving to tradition. Beaters at Holkham still wear bowler hats called the Coke hat, originally commissioned in 1849 and made by Lock’s chief hatter, Thomas Bowler, to protect their heads from low-hanging branches and poachers. A quick word for those who aren’t sure what things like ‘driven shoots’ or ‘beaters’ are, because ‘shooting’ is an umbrella word and our European friends might assume I’m talking about boars. They’re very keen on shooting boars in Germany, for instance, whereas in Britain the main focus is generally on pheasants. And a typical day’s pheasant shooting in Britain normally involves 10 or so ‘guns’ (the participants) standing in a long line outside various coverts as the beaters (those in the coverts) make weird noises and flap their hands to ‘drive’ the pheasants out. Bang bang. Pheasants fall from the sky. Everyone moves on to the next drive. These are punctuated by elevenses, lunch and tea, before the day ends. An exhausting business. Driven shooting in Britain originated as an aristocratic sport in the 16th century. The birds, which probably arrived here with Roman officers who liked eating them, were originally prized for their meat, and early records of them relate to gargantuan feasts. In 1465, the Archbishop of York outdid himself with an inauguration that featured 200 pheasants (along with 12 porpoises and seals, 104 peacocks, 400 swans, 500 stags, 2,000 geese, 4,000 mallard and teal, and six boars). Henry VIII, another chap who enjoyed a good feast, kept a ‘feusant breeder’ who, according to records, had begun his career as a French priest. Maybe it was an off day. On another, in Suffolk in 1876, Bertie shot “close on 6,000 head, nearly 4,500 of which were pheasants” with his pal the Maharaja Duleep Singh, who had lost his Punjab throne as a baby and later made his home at a Suffolk estate called Elveden. There, with the blessing of Queen Victoria, the Maharaja retained the rank and precedence of a European prince. He was a keen and crack shot. Alongside his brother Freddy, at home in Suffolk, he once shot 846 partridges before lunch. He also leased Mulgrave Castle in Yorkshire, near Whitby, where he imported an elephant to transport him around when grouse shooting. Legend has it he also trained his elephants to trump in unison at any break in sport, so the staff at the castle knew to put the food on the table. (Later, in 1931, Winston Churchill had to be provided with a donkey to cart him from drive to drive while shooting at Eaton Hall with the Duke of Westminster because he’d been hit by a car in New York.) Little thought was given to animal husbandry in those days, and their idea of a joke seems fairly rum, too. Lord Randolph Churchill, Winston’s father, while staying at the Marquess of Londonderry’s estate, accidentally shot a fellow guest’s pet dachshund at one drive. No matter, thought Randolph, who carted the dead dog to London’s finest taxidermist and then presented it to the former owner as a present. But despite these larks, it was the Edwardians who turned the shooting weekend into an art form. When I joined Tatler in 2012, I was told The Shooting Party — the 1985 film starring James Mason, John Gielgud and Edward Fox, set during a shooting weekend on a grand British estate just before world war one — was required viewing, and immediately ordered the DVD. Its atmospheric, sepia-tinted take on the social customs of the time is exquisite — “You weren’t shooting like a gentleman!” Sir Ralph Nettleby (Mason) barks at Lord Hartlip (Fox) after he accidentally shoots a beater. Shooting, during these halcyon days for the British aristocracy, was extraordinary. Seven-day shooting parties weren’t unusual (partly for practical reason: it took much longer to get to a shoot in Scotland before the invention of the V8 Range Rover). They required multiple outfit changes, and the shoot lunches were an ordeal (for the staff), usually served al fresco on linen and china, with several courses that had to be transported and kept warm, rounded off with cheese. It was this era that also produced Britain’s top shot: the 2nd Marquess of Ripon, who supposedly holds the record for the largest bag of birds ever shot — 556,000, including 241,000 pheasants. Who says the aristocracy were idle, eh? These days, while shoots on old, great estates like Holkham and Sandringham are still talked about in awed tones, and an invitation to shoot at an estate such as Alnwick (the Duke of Northumberland’s gaff) is much prized, the shooting scene is perhaps fractionally less of a fusty old man’s club. Toffs will happily rub up alongside trillionaires or celebrities. Guy Ritchie invites David Beckham to shoot partridge at his Wiltshire estate, Ashcombe House. Richard Caring blasts Ride of the Valkyries from speakers installed on each pontoon of his duck drive. Leon Max, the Russian-born clothing tycoon who bought the 18th century Hawksmoor house Easton Neston from Lord Hesketh in 2005, invites chic sorts — earls, models, actresses — for comfortable shooting weekends where the food is excellent and the house never cold or short of hot water. Sartorially, you need to be careful, too, as a newbie. You don’t want to swagger into the field dressed like a gun-toting Sherlock Holmes, but you don’t want to let the side down, either. A good jacket will go a long way. Edward Fox sported a Norfolk jacket in The Shooting Party, a curious design making an unexpected return thanks to the likes of Huntsman and the Countess of Lucan’s clothing brand, Lucan. It is belted at the waist and detailed with bellows pockets (for cartridges, hand warmers and any variety of combustible tobacco products) and contrast shoulder pouches. Breeks, or plus fours — essentially tweed knickerbockers — are another key piece. William & Son are soon to release their latest country clothing collection, within which you will find a very fine pair. Peter Sant, the man to see at Farlows, and a tweed obsessive, says punters have recently favoured Meindl ankle boots over wellingtons, as they’re more comfortable for romping about in over shooting socks and garters. Read the full article in Issue 59 of The Rake – on newsstands now. Subscribe here.